During the month of July, many of the Regency Reflections posts will focus on traveling, vacationing, and other summer adventures popular during the Regency. I don’t know about you, but one of my favorite traditions about vacationing is finding the local ice cream parlor! During the Regency Period, if you happened to be in the mood for an ice cream, water ice, or sorbet, you would likely visit Gunter’s Tea Shop, which was located at No. 7-8 Berkeley Square in London’s West End. The confectionary shop, originally named “The Pot and the Pine Apple,” was established in 1757 by Italian pastry cook Domenico Negri. Years later, James Gunter became Negri’s partner before assuming sole proprietorship in 1799. Gunter’s served a wide variety of extravagant pastries, cakes, and confections, but the establishment was probably most well-known for its frozen indulgences. Treats such as ices, ice cream, mousse and sorbet were available in a variety of textures and flavors. While most of these were served in small dishes or cups, some treats were frozen in pewter molds shaped as fruit, vegetables, and even bread or meat to give them a more dramatic presentation. Sought-after flavors included maple, bergamot, pineapple, pistachio, jasmine, white coffee, chocolate, vanilla, elderflower, Parmesan, and lavender, just to name just a few. Not only were Gunter’s creations delectable, but the shop was one of London’s places to “see and be seen.” Located across the street from a park of maple trees, it became quite fashionable to enjoy one’s treat out of doors with family and friends. In fact, Gunter’s was one of the very few locations a young lady could be seen alone with a man that was not a relative without being exposed to scandal. Dining in the park became so popular that the shop’s waiters had to venture out to the streets to take orders and deliver food, dodging carriages and horses to do so. Gunter’s continued to be an admired establishment throughout the nineteenth and well into the twentieth century before closing its doors in 1956. Want to try your hand at making your own Regency ice cream? One of my favorite regency resources is “The Art of Cookery Made Place & Easy,” which was written by Hannah Glass and published in 1796. While I do not know Mr. Gunter’s recipes, Ms. Glass included an ice cream recipe in her book that would have been available during the Regency. 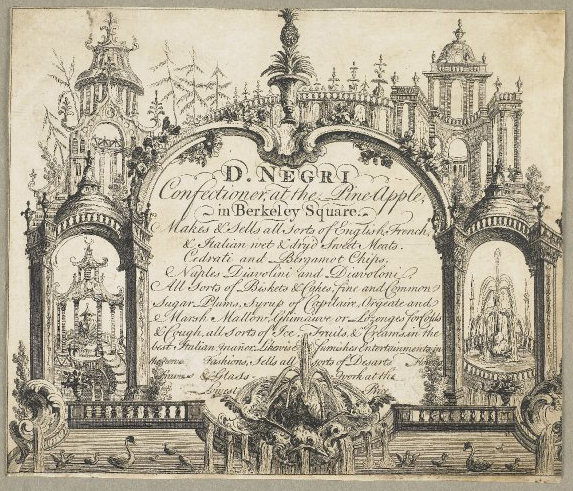 Image of Negri Trade Card courtesy of The British Museum.